Arguably, The Man From U.N.C.L.E. was my very first fandom, with its 1964 premiere predating even my longtime love Star Trek: TOS. I was *mumblemumble* years old and my friends and I used to terrorize the neighborhood pretending to be Illya, Napoleon, various nameless THRUSH bad guys, and various nameless UNCLE good guys. (I always got to be Illya because no one else could do the accent!) Even back then we never had any of the Damsels of the Week in our cast, as everyone knew that Napoleon and Illya didn't need any silly women to help them in their appointed tasks, (though small girls were another matter entirely). I had all but forgotten it, when Ardent, and Linda, a local friend who is a long-time MFU fan reintroduced me to its pleasures. Yes, the show is dated, yes sometimes it degenerates into silliness and occasionally offensiveness, but for all that, it's still a delight. And when you look at it through the lens of history, it broke a few rules in its day. 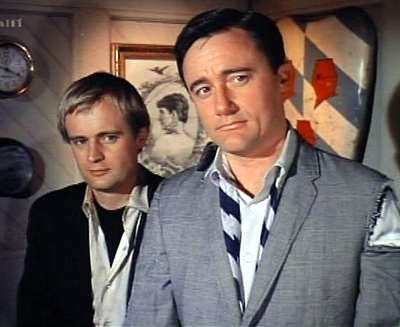 To have a Good Guy (the North American: Napoleon Solo) not only working hand-in-glove with someone whom most Westerners considered a Bad Guy (the Soviet: Illya Kuryakin) to save the world from evil, but also clearly being best friends with each other, was groundbreaking. Anyway, as a "grown up" (though I would argue the term) I find I see another dimension totheir interactions, one I was too young and ignorant to be aware of at the time I first watched the show. I'm not one of those people who sees slash in every male pairing, in fact I see it in damned few, but I do see it in MFU. And felt compelled to write it. For a slashy overview of The Man from UNCLE check out the Crack Van listing for it. Brief synopsis: Sometimes you find something you weren't looking for, and it turns out it was what you needed all along. Webposted 08/14/05. Appx. 44000 words. Brief synopsis: All in a day's work. Webposted 03/26/05. Appx. 95 KB. Brief synopsis: Relationships evolve, people change, but love remains. Webposted 12/09/04. Appx. 140 KB. Brief synopsis: A little dancing around with identities. Webposted 10/12/04. Appx. 97 KB. Brief synopsis: Everyone has a weakness. Brief synopsis: It's never too late. Brief synopsis: Sometimes you don't have to look as far as you thought to find the one person with whom you can truly be yourself.